Medical coding is known as that process which is involved in assigning standardized and formal medical codes to the medical records of a patient. Every time patients visit a hospital or a clinic, medical records are being created. These records will contain information that identify the patient and describe his demographics. The records will also contain descriptions about his main medical complaints, procedures performed in the past, prescribed medications, follow-up instructions and diagnosis. Different types of companies are now using the medical coding process to make their operations flow smoothly and these include consultation firms, law firms, clinics, private physicians, hospitals and home health care agencies. Medical coding can also be defined as the process of transforming narrative descriptions of injuries, healthcare procedures and diseases into alphanumeric and numeric designations that are referred to as code numbers. Medical coding certification holders make it a point to create detailed code numbers to ensure that each diagnosis and the procedures conducted to correct an illness or diagnosis are accurately described. The medical codes are extremely useful especially in the healthcare industry and these include proper identification of symptoms that should be immediately evaluated, alerting healthcare professionals to certain allergies and illnesses that are already life-threatening, making essential administrative functions easier including scheduling, staffing and increasing or decreasing services linked to healthcare and comparing useful and effective healthcare facilities. If you have longed to work in a company as a medical coding expert, then you should know that Brainmeasures, a legitimate and well-trusted online certification and testing company, can offer you the most comprehensive medical coding certification program which covers all the topics that you need to become an expert in this field. Taking up a medical coding course in Brainmeasures is a good decision as the company works effectively in supplying the most accurate and detailed information about medical coding. 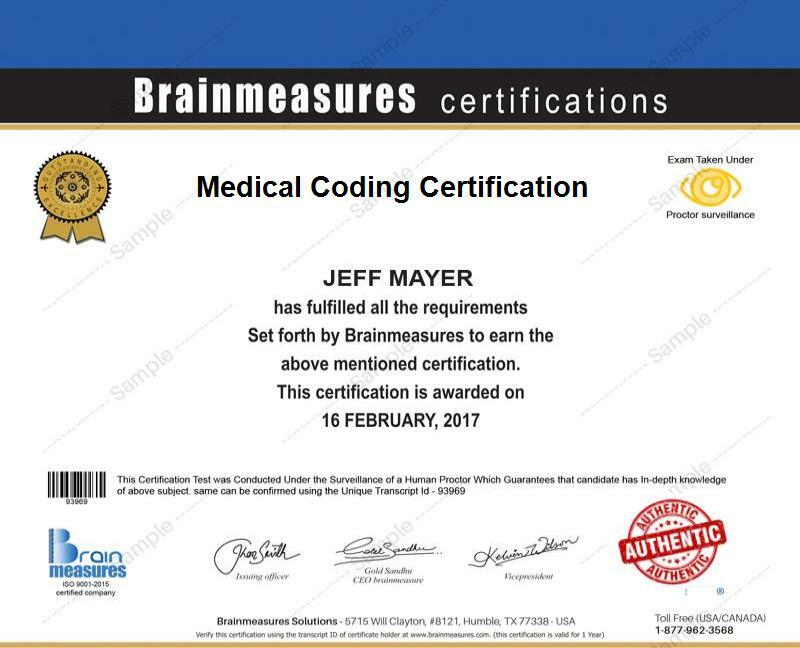 Through the comprehensive medical training provided by Brainmeasures, you will obtain a clearer idea about how the entire coding process is carried out and the different systems used in creating code numbers. To determine if you already deserve to hold your certificate, Brainmeasures will evaluate the level of your knowledge and skills through the medical coding exam developed by real experts and professionals in the field. Holding your medical coding skill certificate will allow you to start working in companies that desperately require your services and expertise. The existence of the medical coding certification program in Brainmeasures is extremely beneficial to a wide array of individuals. This certification course is even more useful for people who are interested in getting an employment in the medical coding field, those who wish to change their job skills and be part of the medical office records environment and for those who dream of honing their skills in order for them to turn into an expert and certified medical coder. If you are thinking about how much you will earn after you become a certified medical coding expert, then rest assured that your salary is decent enough to give you a more convenient living. Medical coding certification holders can be expected to earn around $20,000 to $50,000 per year. You can expect this amount to grow even more in the coming years especially after you receive more experience. Note that you can also earn a substantial amount by working as a certified medical coder at the comforts of your own home either part-time or fulltime.